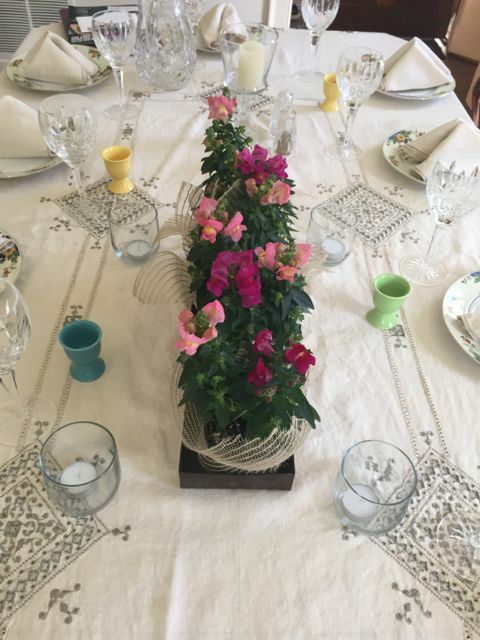 Hosting a dinner party is something my husband and I would love to do more often. There is something about gathering a group of friends to sit around a large table for a few hours and just sit and talk. Now that are kids are older, no one is rushed to get home to sitters and everyone seems more relaxed. I know you are thinking the idea of hosting a large group for dinner can be intimidating. Well here is a little secret, when people ask what can they bring, give them a duty, from appetizers to dessert to wine people won’t mind. So now that you have a few of the tasks taken care of, you can put the effort into making the dinner party even more special by incorporating a theme, such as this wine themed party I recently hosted for some friends. As I was setting the table for a recent dinner party, I was thinking about place cards and decor. 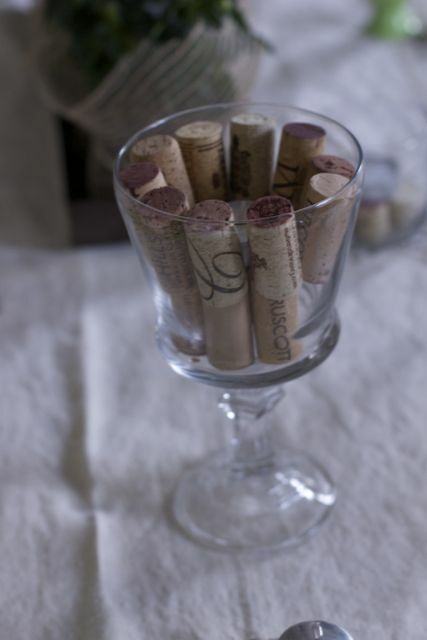 I looked at my bar at the overflowing jar of wine corks and the ideas started to emerge. Maybe you don’t think of placards for a dinner party, but I love mixing things up and not allowing couples or friends that know each other especially well to sit together. I put some effort and thought as to who sits in proximity of each other to ensure for active conversation. 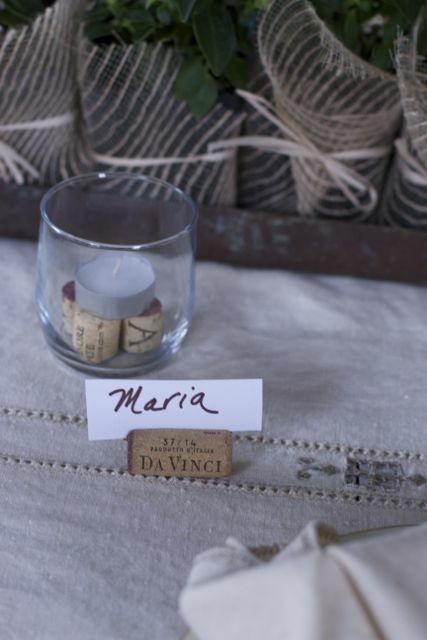 To make the wine cork place cards, simply trip off a little of the cork so it won’t roll. Cut a slit opposite of where you shaved the cork to slide a name card. I simply typed up a document with the names and printed them on card stock. 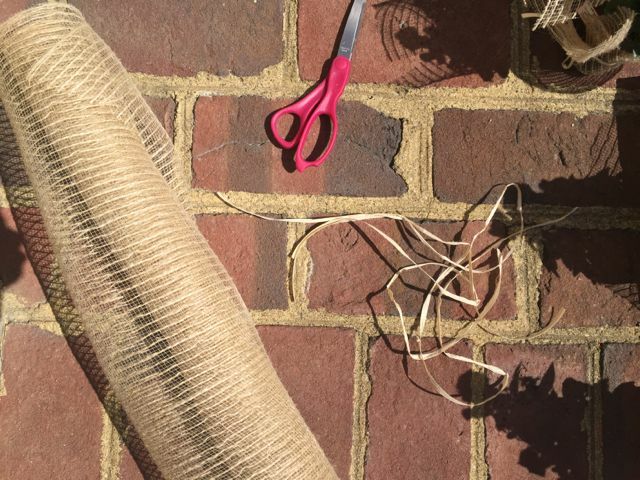 Cut them into strips and insert into your cork. 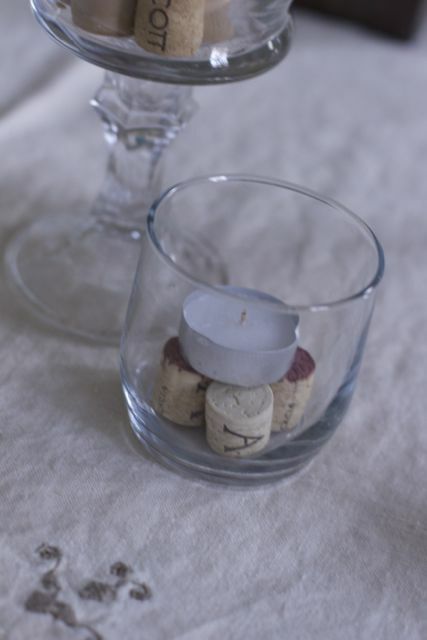 For decor, I cut more corks and added them to votive candles and then placed a votive on top. For these taller DIY Dollar Store candle holders, I just lined the bottom with corks and then lined the second layer around the outside. Place a votive, either a battery operatated or small votive. The light will shine thru the candles and it is a great touch. The centerpiece I made for this wine themed party, also served as our party favor. 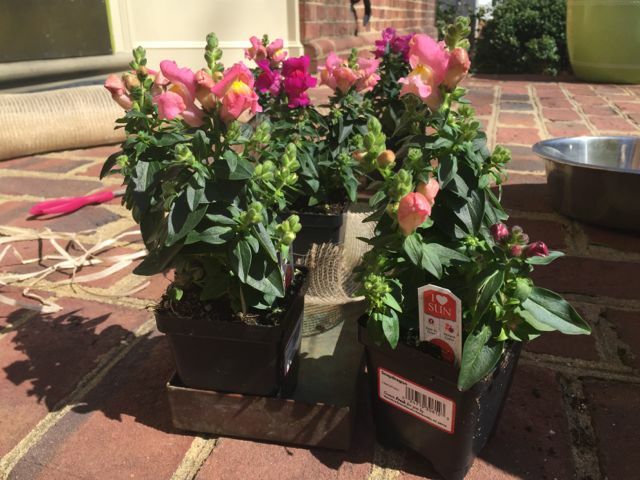 I know Party favors for a dinner party seems over the top, but for less than the cost of a floral arrangement you can make this rustic centerpiece and then give each guest a flower to take home. This wine themed party favor served as a thank you for guests chipping in to help with the meal. 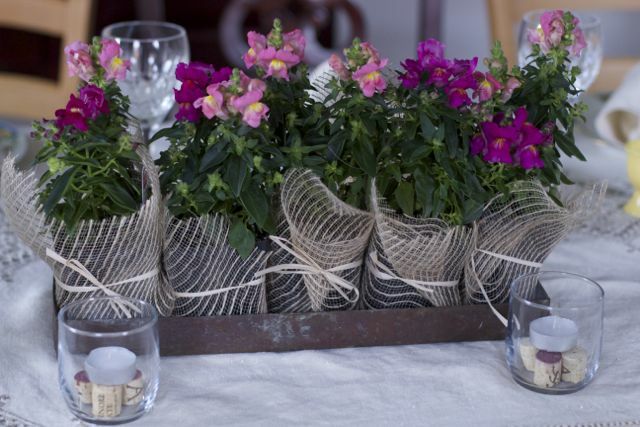 I purchased inexpensive annual flowers, then wrapped them in burlap and tied it up with a little raffia ribbon. Set them together, I used a copper plant tray, and you have a wonderful centerpiece and sweet token of your wine theme party. Whether you are hosting 4 or 20 for a dinner party, think about incorporating some of these wine party ideas as an extra touch. This picture was shot before I decided to go with the wine theme, seems boring doesn’t it? 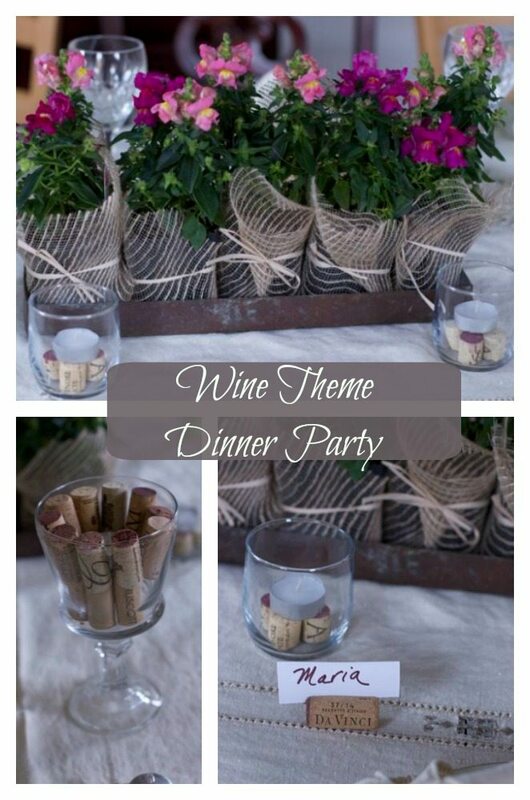 What other decorations would create for this wine themed party?